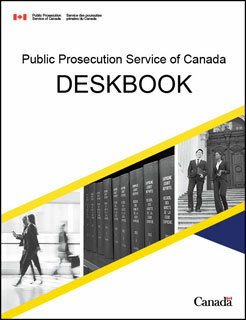 Federal prosecutors, whether employees of the Public Prosecution Service of Canada (PPSC) or private-sector agents, are guided by the rules and guidelines included in the PPSC Deskbook (html) (pdf). The PPSC Deskbook sets out the guiding principles which all federal prosecutors, and persons acting as federal prosecutors, must follow. It contains directives and guidelines that instruct and guide federal prosecutors, whether employees of the PPSC or private-sector agents, in the exercise of their prosecutorial discretion. The PPSC Deskbook replaced the FPS Deskbook (archived) on September 2, 2014. On June 16, 2014, the Attorney General of Canada issued a directive under section 10(2) of the Director of Public Prosecutions Act directing that all federal prosecutors and persons acting as federal prosecutors respect his directives set out in the PPSC Deskbook . This applies concurrently with the guidelines issued by the Director of Public Prosecutions and contained in the PPSC Deskbook .